SNMP Monitor is an advanced IPHost’s monitor. SNMP, or Simple Network Management Protocol, is a protocol widely used to request and/or modify miscellaneous parameters of a network device (including computers,routers and almost every type of hardware equipped with a network interface). Traditional approach is to request SNMP variable (poll) and react to its value respectively (as SNMP Custom monitor does). Although polling has its advantages (you can gather information at given time intervals and build statistics), it has a significant drawback: whatever happened at the device being monitored, the event isn’t available until the next poll occurs. 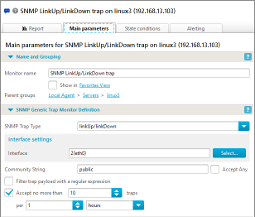 The so called SNMP traps handle this: simply put, SNMP trap is a technique to send asynchronous response to the client when an event happens. The event can be either built-in (e.g. line is up or down etc.) or invoked programmatically. Manual handling of SNMP Traps requires creation of a script or program to be called. IPHost Network Monitor provides easy to use and flexible means to handle this. Note that IPHost SNMP traps monitor is a passive type of monitor. Whereas all the monitors available so far were active (the device to monitor was polled), SNMP traps monitor is called when an event happens on the target device. To set up this type of monitor, you should provide a host name and then select traps parameter(s). The built-in trap types (linkDown, linkUp, coldStart, warmStart, authenticationFailure, egpNeighborLoss) as well as custom (where a definite OID should be specified) can be used (see MIBs database). 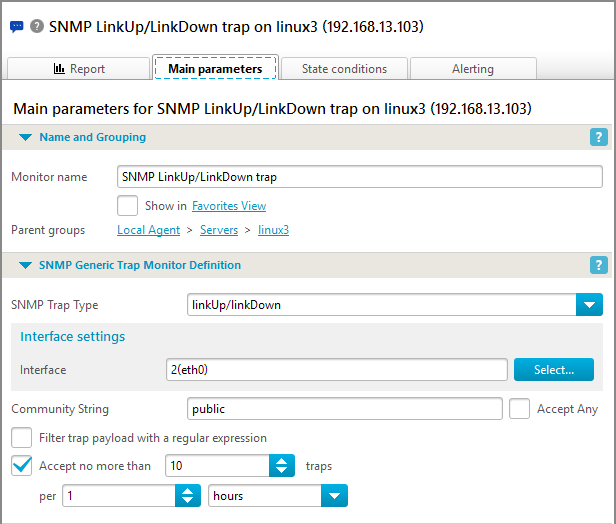 Since traps can be sent by means of software, SNMP trap monitor can be the optimal tool to receive important notifications as soon as possible. The architecture of SNMP allows to use the results of an arbitrary piece of software and/or script as a value of known OID. Thus, SNMP trap monitor is the universal tool to send alerts about abnormal situations immediately. Low memory, disk quota exceed, line down state, important service not running – any condition that can be detected by a program/script, can generate SNMP traps. Although IPHost SNMP traps monitors should be used whenever a real-time alerts are required, custom SNMP monitors should still be used to collect statistics about important system parameters. Note also that the computer running IPHost Netwrk Monitor instance must accept incoming SNMP trap UDP packets (make sure firewall doesn’t block those). Monitoring Features Here you can find the list of monitor types supported in IPHost Network Monitor and brief description of their parameters. Application Templates Here you can find the list of application templates supported in IPHost Network Monitor and their short description. Network Discovery Helps you to create a basis of your monitoring configuration and automates the task of detection network hosts and network services. Alerting Features Here you can find the list of alert types (ways of reaction to the problems happened during monitoring) available in IPHost Network Monitor, and their brief description. Reporting Features Here you can find the list of report types available in IPHost Network Monitor with brief descriptions. and structure Here you can find an overview of IPHost Network Monitor components, Windows and web interfaces.